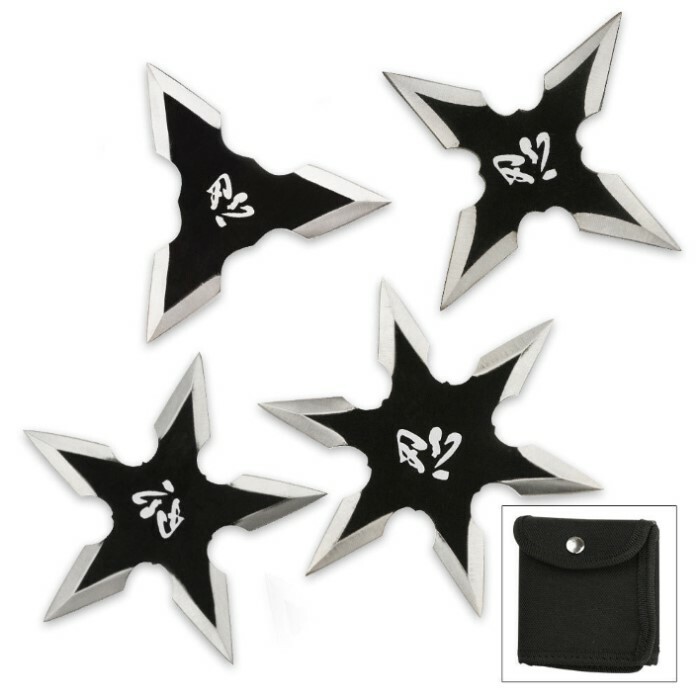 Kung Fu Four-Piece Ninja Throwing Star Set With Pouch | BUDK.com - Knives & Swords At The Lowest Prices! Add a little more zing to your ninja gear collection with these Kung Fu ninja throwing stars. They feature solid 440 stainless steel construction with a durable black finish. Each one features multiple piercing points and sharp edges for ultimate target penetration. The entire set is housed in the included nylon pouch. These are the perfect throwing stars to hone your Ninja throwing skills. These throwing stars are awesome. Me and my brother took them outside and threw them at a tree. They landed every time. I got these shortly after ordering them they came razor sharp ready to use although I don't recommend people throw these at anything metal these things slice straight through wood and other targets metal cans and bottles very fun I got ten feet away and threw the four point the smaller ones are so sharp they went an inch deep every time! Like a lot of the products I've seen, these are stainless steel. It's a lower quality metal and relatively soft, so you get nice sharp throwing stars, but they don't hold their edge at all. Thankfully, the point has held out well on these and they've been very enjoyable to throw. 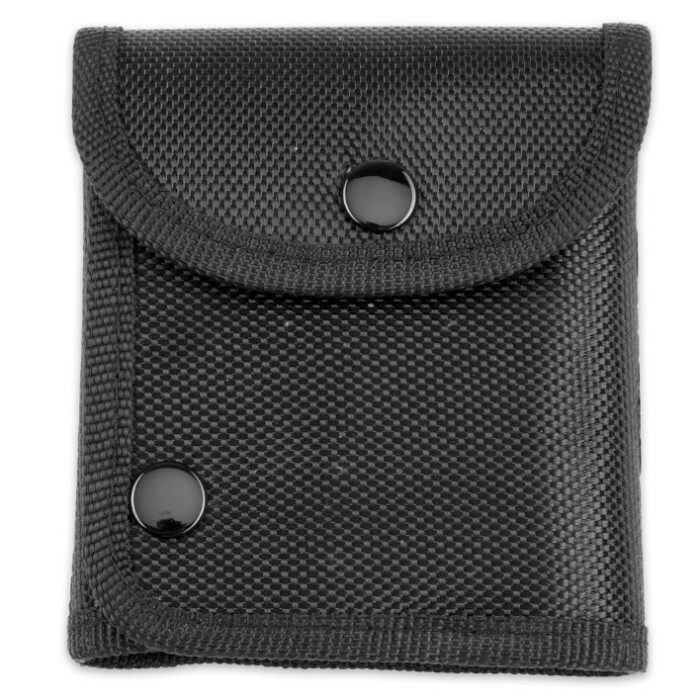 The pouch is a heavy material and feels very sturdy, however it's very difficult to slide the stars in and out. It is simply a storage solution and I would recommend something less frustrating if you use the stars often. I've seen some other throwing stars that all seemed tiny and undersized. I wouldn't call these large but they're a proper medium and really well done. I like the case, although it seem a bit extravagant for the set. I plan to keep it and use it for storing the stars since it looks well-made. The set is great- a cool variety of 3, 4, 5 and 6 pointed stars. Simple design, but none of the stars look cheap. All are fantastic throwers and wicked sharp, with blade edges sharpened on both sides, which really makes these look cool. At a few bucks each- you can't beat these. These stars are big, tough, and worth the money! Some of the tips broken upon receipt but other than that they're are tough and lots of fun! Best stars I have found out there. Very strong and Durable. Allow me to be the first review for these insanely perfect and awesome ninja stars! Each one is special and awesome! They are perfect size and land almost every time! Yes they come out of the package all slimy, but it seems like most of the things from this website do. The package is complex but easily holds all 4 ninja stars. Definitely one of the best ninja star sets to buy on this website!